It’s a quite well-known fact that Koreans drink A LOT. It is the reason why you can find plenty of hangover products, such as hangover recovery drinks and candies. You can easily find them in convenience stores like GS, CU, and 7-Eleven, even in lobs, and lotte market. If you follow Korean dramas, you must have seen these ramyeons before. They come in various kinds and tastes and they are convenient because cooking ramyeon takes less than 5 minutes! They also come in a cup-type or a 5-in-1 pack; pack ones seem better to put in your luggage. How could we remember hangover cure products but forget the alcohol itself LOL? Korean alcohol is one of the things many foreign visitors in Korea bring back home. Soju and Makgeolli are relatively cheaper than those in their home countries. So why not try to fit one of these bottles in your luggage. It’s said that Korea’s beauty products, including BB Creams, cushions, facial packs, mask sheets and other makeup products are gaining popularity in the world. You can easily find them at drugstores like Lobs, Olive Young and Watsons and beauty brand stores such as Innisfree, Etude House, aritaum, Skin Food and so on when you walk on streets. Tourists won’t miss the K-pop related products, especially for a huge fan of K-Pop or K-Drama. There are official stores around Seoul where you can find every kind of goods such as autographed posters, paintings, calendars, T-shirts and many items. The most famous Korean red ginseng brand is called “Cheongkwanjang”! This is a good souvenir for elders if you wanna find something healthy food products. They also have ones for children. Gim looks like a paper-like dried seaweed with a bit of salt sprinkled and spread with sesame oil, which is full of calcium, vitamins, and carotenes. It’s not expensive and with relatively little weight. As for kimchee, no need to explain more, kimchee is already well-known enough LOL. From spoon and chopstick sets, plates, ceramics, key chains, to teacups, visitors can easily purchase plenty of traditional items around Insadong and Bukchon hanok village area. 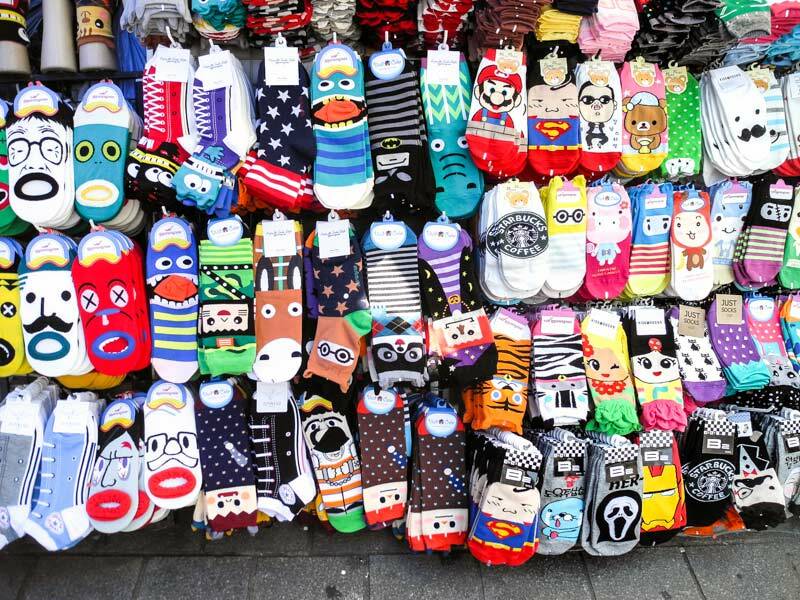 There are so many cute and unique pairs of character socks in Seoul. Wearing these socks with famous cartoon characters or idol characters, you could become a stylish person. Korean snacks are yummy and easily get from supermarkets or convenience stores. Once you try Korean snacks, you will like them and want to share them with friends and family. So, it’s really a good idea to bring snacks home! 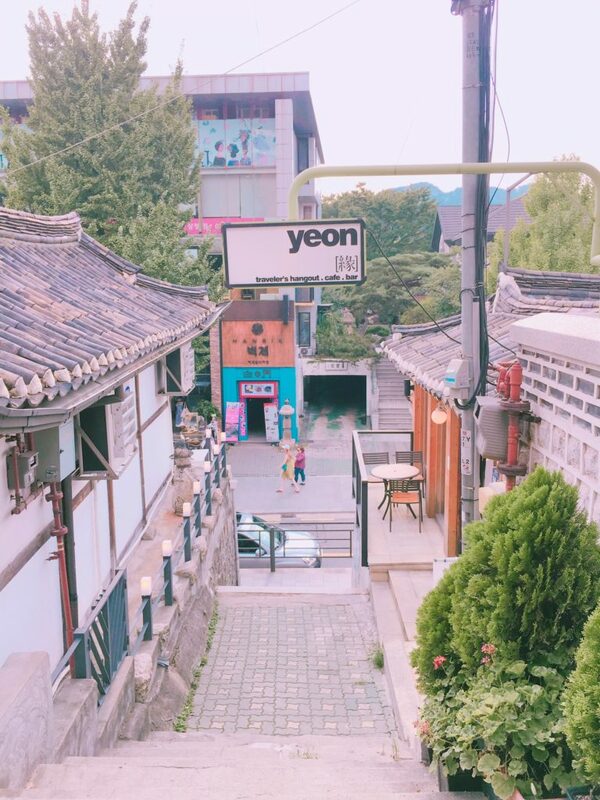 This entry was posted in Souvenir, goods and tagged alcohol in korea, Food, Korea, Korea travel, kpop, recommend, Seoul, snacks, socks, souvenir.